The Bermuda U/15 Girls Football Team advanced to the quarterfinals of the CONCACAF Under-15 Girls’ Championships after recording their third consecutive victory with a 7 – 1 hammering of Antigua & Barbuda today. Bermuda was drawn in Group E with Cayman, Antigua & Barbuda and Bahamas, and the island’s young footballers have made a superb showing, as they began competition with a 3 – 0 victory over the Cayman, followed that up with a 3 – 1 win over the Bahamas, and then defeated Antigua & Barbuda 7 – 1 today. 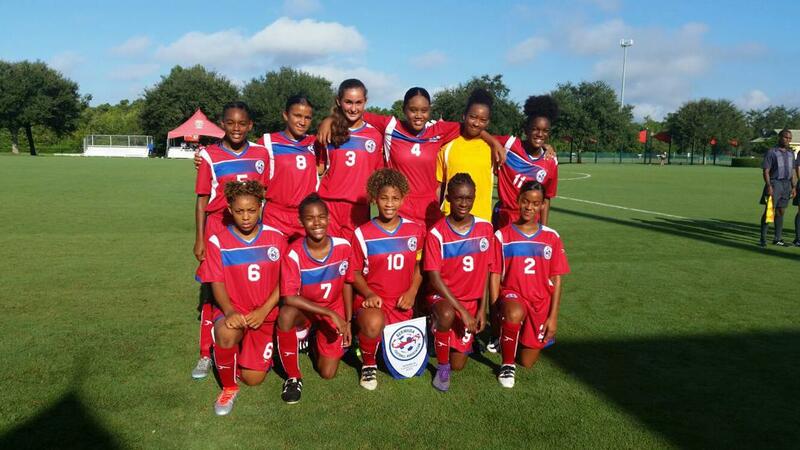 The CONCACAF match report said, “Curacao [3W-0D-0L, 9 points] and Bermuda [3-0-0, 9] sealed quarterfinal berths in the 2016 CONCACAF U-15 Girls’ Championship quarterfinals, finishing first in Group D and Group E, respectively, with wins on Sunday at the ESPN Wide World of Sports Complex. Bermuda’s team includes Leilanni Nesbeth, Zakhari Turner, Adia Gibbons, Koa Goodchild, Gaiya Melakot, Megan Titterton, Tianna Mullen, Delia Ebbin, Emily Cabral, Danni Watson, Jadae Steede Hill, Trinae Edwards, Jya Ratteray Smith, Jaden Masters, Jordan Davies, Sh’Nyah Akinstall, Lindsey Pacheco and Nia Christopher. There are over 20 nations competing in the tournament including Anguilla, Antigua & Barbuda, Bahamas, Barbados, Bermuda, Cayman Islands, Curacao, Dominican Republic, Grenada, Haiti, Jamaica, Puerto Rico, Santa Lucia, St Vincent & Grenadines, Trinidad & Tobago, US Virgin Islands, Costa Rica, El Salvador, Nicaragua, Canada, Mexico, United States and Venezuela. The quarterfinals will take place on Wednesday, August 17,and will see Bermuda take on the USA while Canada will match up against Curacao. Congratulations to the entire coaching staff, team and PDC/BFA Executives. To play the USA is a positive step forward. This will allow us to guage where we are in comparison to the major women’s teams.